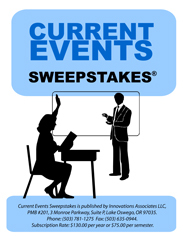 Current Events Weekly began as Current Events Sweepstakes in 1968 and is a convenient way for teachers to include current events in their lesson planning and create a dynamic activity in their classroom. Issues are published weekly, and come in two editions: the Print edition and the Online edition. Both editions are included in our standard subscription rate. The Print Edition is published as an Adobe PDF document that you can download and print out. Each page focuses on one category and contains all the questions and answers for that category. The Online Edition is a web page that lets you display questions and answers interactively in class using a computer and projector. Introduced in 2013, it replaces the PowerPoint Edition published previously. Suggestions on how to play Current Events Weekly in your classroom are provided in our Organization, Rules and Procedures documents. This includes how to organize the class, rules for conducting classroom activity, and how to score. We've also included a sample seven-week schedule for conducting a competition among the teams in each class.